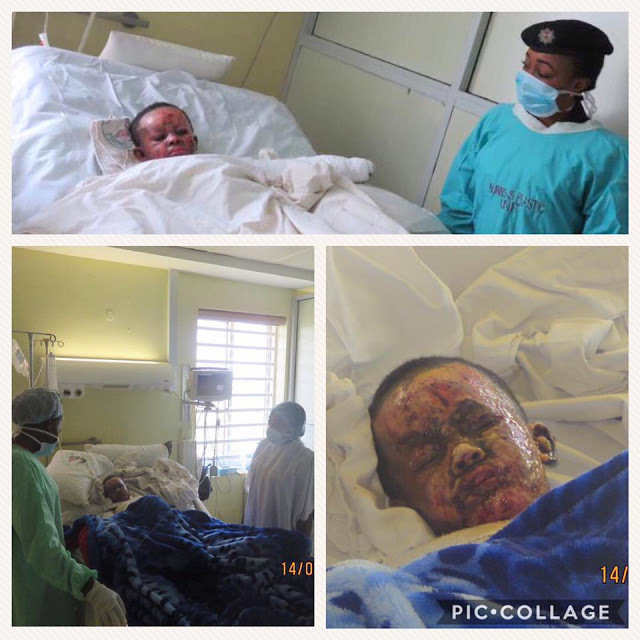 A little boy identified as Michael suffered severe burns and is currently hospitalised at the Burns unit National Hospital, Abuja after his neighbour mistakenly spilled fuel on him. "A neighbour was fuelling her generator set and in the process fuel spilt on him. Being a little boy that he is (ignorant), he never knew the gravity of what’s about to happen to him when he got home and his mum asked him to bring the candle from the sitting room. Little did she know that his cloth had sprinkles of fuel on it. That’s how disaster happened and his cloth caught fire. But thank God he's alive, we can all find a reason to celebrate the love and joy we share. success and most importantly he’s a survivor. 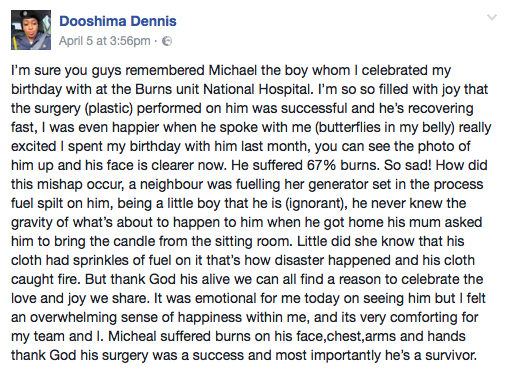 I’m so so filled with joy that the surgery (plastic) performed on him was successful and he’s recovering fast. It was emotional for me today on seeing him but I felt an overwhelming sense of happiness within me and its very comforting for my team and I.
I was even happier when he spoke with me (butterflies in my belly) really excited I spent my birthday with him last month, you can see the photo of him up and his face is clearer now."